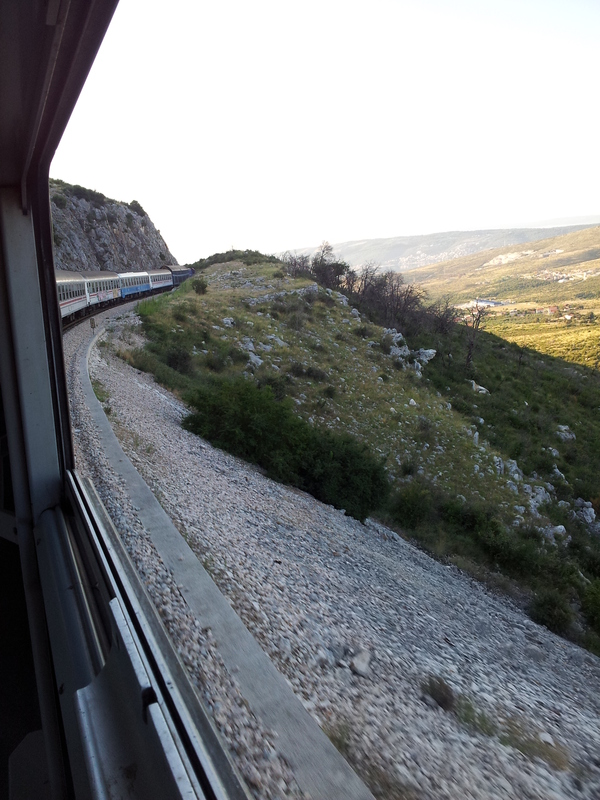 Zagreb to Split by overnight train. | Where's Zoe now? Zagreb to Split by overnight train. Yeah, so this blog is rapidly turning into a collection of “Zoe catches a train” stories and I don’t care. As an aside, I definitely get it from my parents: a few years ago they took a trip around the US by train which from their accounts sounds amazing but if you know them you can just imagine Dad geeking out about AMERICA!!! the whole time and Mum being the most organized person to ever take a multi-week trip with only a small carry-on bag. Like I say, I get it from them. So there I was at Zagreb’s main train station at 10.30 pm, peering into the train that was going to trundle down to Split overnight. It was a cool evening and I was glad I’d changed into jeans before I left my hostel. Almost everyone else on the platform was a backpacker, presumably with the same idea as me: get to the coast, with a night’s accomodation, for around 200 kuna (~30 euro). My ticket was for a seat, which I was quickly realizing was going to be a bolt-upright seat in a compartment of 6 — 3 facing 3. Uh oh. I can sleep on planes, but I need that 1–2 inches of reclining and I prefer not to have to negotiate leg room with the stranger facing me. I kept walking along the train, and I’m glad I did because right at the end was the one car that had couchettes. A horizontal bed! What luxury! I found the conductor, and she had a spot available, for 13 euro (euros, not Croatian kuna. Huh?). I’ve paid more than that for mediocre sushi in Torino. Easiest sale she ever made. I started to see why it was only 13 euro when I got into my compartment and there was zero aircon. It was sweat-pouring-down-your-face hot. There wasn’t much of a common language between the 6 of us in the compartment, except for the phrase “very hot” which we all agreed on, except for the Serbian lady who was apparently completely unaffected by heat and kept her cardigan on the whole time. As I was settling in for what promised to be a sticky night, I heard a girl in the next compartment say “Maybe we won’t be able to sleep, we’ll just have to party all night!” I got my earplugs out. Once we got moving, the open window made a huge difference to the temperature and I ended up dozing beautifully, rocked by the motion of the train and the low background noise of the diesel engine (Ms Party All Night seemed to have slept, too). I say dozing, because it’s hard to fall into a deep sleep when you’re on the upper (3rd) bunk and the straps that are supposed to stop you from falling out and breaking your leg are only tenuously attached. I swear my phone has an anti-Instagram filter and real life looked 20x more magic-light than this. Yup I’m on a train. Practical details for future reference: You can buy tickets at Zagreb station and don’t particularly need to book in advance as far as I can tell (though I don’t know if the ticket window stays open as late as the train departure — I bought my tickets the day before). The lady at the ticket window didn’t mention to me there were couchettes, which is how I ended up with a seat ticket, but they do exist! The train leaves Zagreb at 11-ish and arrives in Split at 7-ish, at the train station which next to the bus station and the ferry terminal. 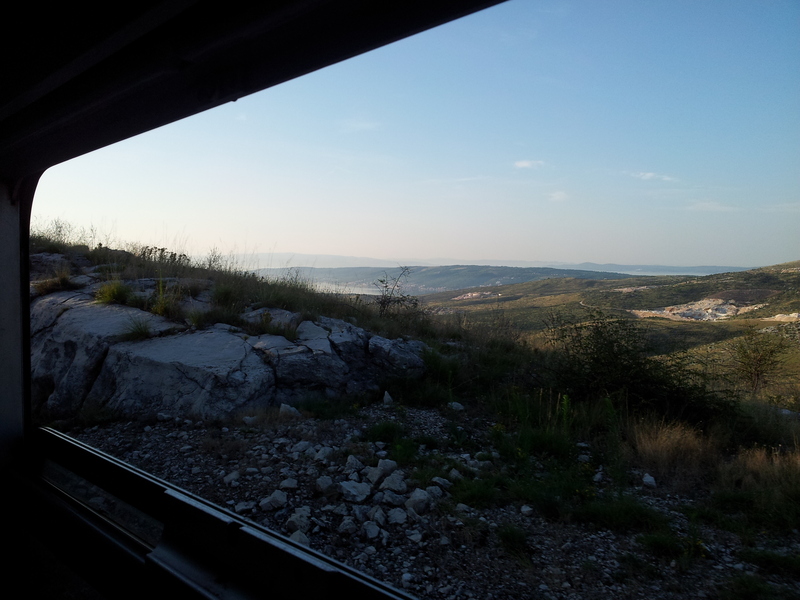 This entry was posted in Croatia and tagged split, train, travel, Zagreb on September 3, 2014 by Where's Zoe Now?.